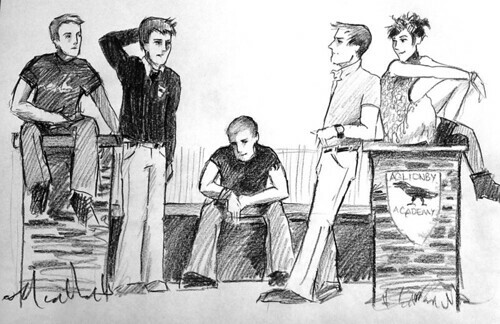 The World According to Maggie: Win a Raven Boys Doodle. And an Audiobook. Today I was laying about and complaining about my missing teeth and eating ibuprofen and instead of working, I did a little doodle of the characters from The Raven Boys. ME: I did this. Is it fan art if I'm the one doing it? FACEBOOK: No. Yes. Maybe? Whatever! Give it away with a contest! I always do what Facebook says, because surely, surely it is never wrong. So here's a contest for this doodle. 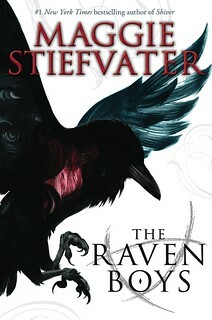 Because it seems like not a very exciting prize to me, I'm also adding in a signed audiobook of The Raven Boys. Will Patton narrates it and does a freakin' fantastic job with all of the voices. Because I'm mostly laying about being useless, I'm making this a really simple contest. Basically, change your icon on any of your social media sites — Facebook, Twitter, Goodreads, whatever, to the cover of Raven Boys until this time tomorrow. Then post the link of where you've changed it into the Contest Machine site as your entry. Please note that unless you enter on the Contest Machine thingy, you are not entered! A blog comment doesn't count! Here's the cover. You can right click on it to save and all that good stuff. Tomorrow evening, I'll pick a random winner, double check that the icon of the person I drew is changed, and taDA. And everyone can change their icons back to their dogs and stuff. It's open internationally. Sound good?